How do these triplets code for these proteins? I am slightly confused by the diagram above. The first codon of the unaltered DNA is AAG. During transcription, isn't this coverted to UUC (mRNA). So doesn't UUC code for phe and not Lys? Likewise, how does TAG code for a stop codon? Isn't it transcibed to AUC, which codes for ile? Also, is that the coding strand or template strand? If there is a mutation in the coding strand, is there any impact on the protein? 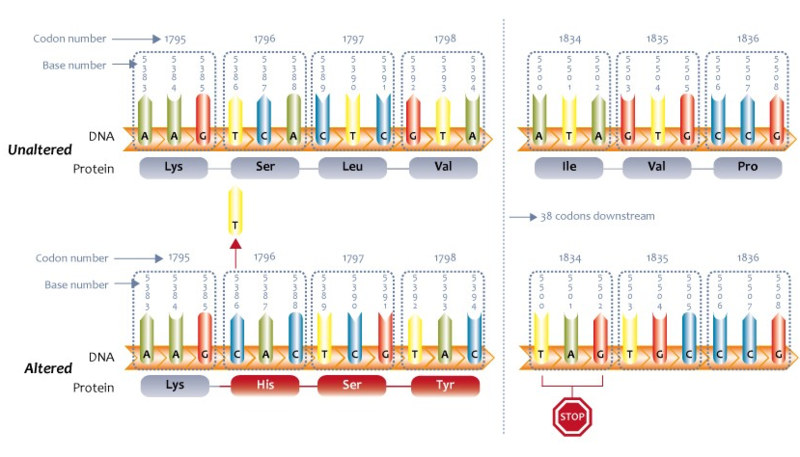 In the first image, AAG is the true codon for Lysine. So when the ribosome hits "AAG" in the mRNA it recruits a Lysine-tRNA. What can be confusing is the use of the term "coding strand" when talking about the DNA. The coding strand is illustrated in the second image you posted, and it is the coding strand of DNA that the first image is depicting. What "coding strand" means here is, this is the strand that looks like the mRNA will look. Depicting the DNA coding strand like this--i.e. as a series of codons--can be slightly misleading since we know codons really only mean anything when in the form of mRNA. Nevertheless, it is a common way of thinking about DNA. Back to the first image. Because it is showing the "coding strand" of DNA, the "template strand" for 5'-AAG-3' then must be 5'-CTT-3'. Hence, when this strand is transcribed by RNA polymerase, the 5'-CTT-3'(DNA) becomes 5'-AAG-3'(mRNA). How many nucleotide pairs code one gene? How do genes code for differences in arms and legs? What is the difference between silent and synonymous mutations?